It’s 7:30 am and here I am writing my blog post because I am so excited about Parker. Each ride seems to be better than the last and we are really starting to come together. Here is some video from my lesson last night with Mogie. I included the good, bad and ugly because that is what training green horses is all about. I left on the audio as well for those who are interested in the process of what we are working on. I would like to change a million things about my position starting with my hands, arms and elbows but you know that is life. I don’t necessarily like sharing video of myself riding because I am so critial of myself but the end result of all riding is how your horse performs and I do think I am good at putting good basics on a horse and giving them the confidence to progress in their work. Parker has done a 180 from the horse he was when he arrived. He has a completely different attitude and just seems happier about life. He is working with me instead of against me. Mogie is an excellent instructor with an eye for detail. She can instantly pick out what a horse needs and will tell you that every horse if different so be prepared to change your plan. She has given me so many different tools just because she teaches so many different ways to address the same problem. 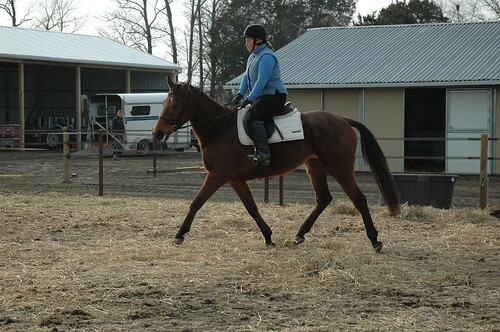 Horses like Parker can be challenging but if you are flexible in your methods and patient you can figure them out. He doesn’t have a mean bone in his body he just needs to be given some direction in appropriate response. You can hear Mogie giving me instruction but the theme of the ride was that Parker is really stuck and not willing to stretch into the contact. Ride him really forward up to the bridle and do a bit of wider hands with him to keep that steady feel no matter where he wants to go. Try to catch him with the leg and a bit of wide hand when he wants to escape and gently channel him back to forward and down. He has no behavior in the canter so that was awesome! Each time I canter him he believes in me a bit more. 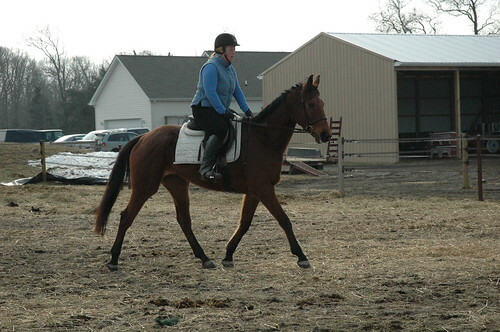 He has a nice canter he just needs a lot more strength. Poor guy was exhausted with 30 min of work but I think he was very proud of himself. He is a real joy to work with and I can’t wait to do more and more. He is also nice to handle as we are loading/unloading in the dark and going different places all the time. He is so brave and nothing phases him so that is really cool. The horses are making a ton of progress in a short amount of time. Getting in new horses is a lot of fun but also very challenging as you have to take the time to figure them out. Every horse is treated as an individual at my farm and it might take me a few rides to figure out what type of program they need, how to ride them, saddle they like, bits they like and what makes them tick. For the most part, I will ride anything that comes my way. I enjoy a challenge and the process of figuring out what makes them tick so that I can get inside their heads. I even like really tough horses as long as they aren’t going to kill me. I expect to hit the dirt as it is part of what I do but a horse who doesn’t improve or one who has no sense of self preservation just doesn’t have a place in my barn. Riding is supposed to be fun not putting your life on the line. Parker arrived with an attitude. He had been getting some training from someone who is 100x better of a rider than me. Something about the relationship between the two of them just didn’t work. I didn’t understand his attitude because I remember him as this horse. Our first few rides went fairly well but he was a bit pissy about life in general. Then our trip to the indoor resulted in me testing out the nice footing 🙂 I wasn’t at all worried just still working towards figuring out a plan of action. Changed the bit, got the chiro out, did a bunch of trail rides and went back to see how we have progressed. I rode in the ring twice over the weekend and it went really well both times. I see some general attitude changes happening with him. 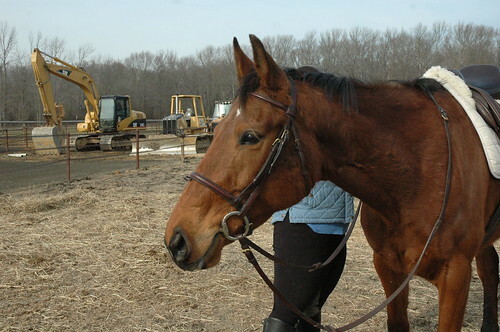 For example, when he first arrived he fought me hard when I tried to put on the bridle. Head straight in the air with his teeth clenched. This weekend he almost took the bit himself (I am using the HS duo). He was not interested in people at all and would walk away from me. Now, he is following us around everywhere. He was antsy in the cross ties and didn’t seem relaxed. Now he stands there sleeping mos of the time or looking for treats. I felt like he was just anticipating something happening while being ridden. Can’t really say what he was worried about but he sure was worried. He spends a lot of time either being behind the leg or flying off with his big trot making me giggle. When I would correct the trot rhythm he would get very pissy but now we are on much better terms. Contact..mmm very fussy to the point of throwing a real fit. The bit change has helped with that some but right now I am going for a fairly relaxed contact just riding him forward and not worrying about frame or anything else for that matter. The canter is a mess and that is his real challenge at the moment. 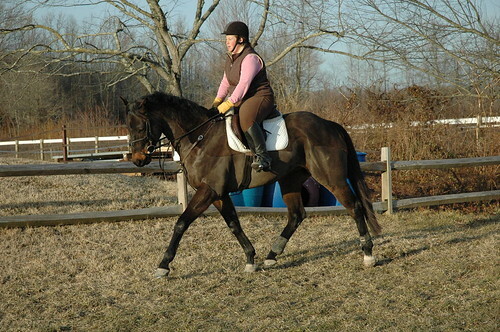 He just plain throws a fit the first canter transition every single ride. The good thing is that they are getting less and less severe each ride so progress is being made. I think part of the issue is that he is lazy and the other part is that he is expecting something from me and anticipates it. When nothing happens he goes oh okay and canters nicely the next time we do the transition. I can’t get him to canter very far at the moment but he isn’t strong enough and I refuse to hold him up. I could pick a fight about it but I don’t see much reason to do that in the initial training. If he physically isn’t strong enough then why should I force the issue. Just keep hacking him out until he gets stronger and has no more excuses. We took some video and please don’t judge to harshly. My regular big 100×200 ring is unrideable at the moment and this is a small area that was very slippery and it has lots of slopes in it. Just look at the nice moments and imagine how cool he is going to be. She is an interesting horse because she gets really nervous but she is never bad just nervous. I was walking her up to the front of the house to let Kurt know I wanted him to come out and get a bit of video. Poor girl about had a heart attack each time she saw something scary but the funny thing is she just wants you to be there she isn’t trying to jump around or do something bad. She left me a nice pile of poop in the front lawn. She seems to have a never ending supply of manure coming out of her. What fun that is. She was a bit looky in the new ring unlike Parker who is about as brave as they come. I wouldn’t say Dee isn’t brave she is just more cautious. I walked her once around in hand and then went to the mounting block. She wasn’t keen on standing so I just stood on top of the mounting block and lunged her around it. She got really bored with that so I hopped on and she stood really nicely. We walked a few laps and then she wanted to go so we just trotted along not worrying about much at all. I am not asking her to do anything at this point as she is not capable. 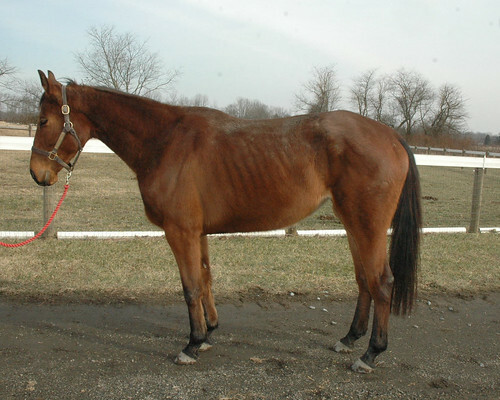 She doesn’t have hardly any muscle on her and you can just feel she is a bit weak. When you go to the right she can’t hold herself straight. At the end of our ride I asked her to go a bit into the contact and she was really willing. She is going to be really nice even if it doesn’t look it now. She is so eager to please and that is half the battle right there. Give me a horse with a good attitude who is smart and progress is easy. 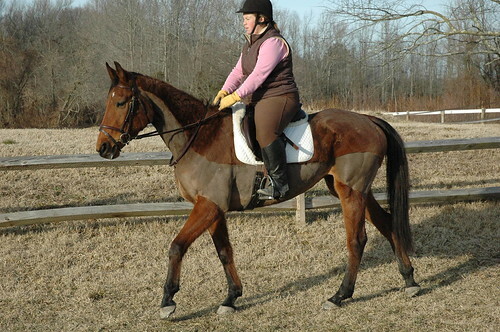 She has a really nice comfortable trot and canter. She is quite balanced for that really small area. We have no right lead but I expected that. I think she will need another few chiro sessions and just some basic rebuilding work. I really enjoy her and can’t wait to see her come along. She claps her lips together they whole time you ride her which is really funny. She also plays in her water and does other funny stuff. I need to get some weight on her but I think that could be a slow process. She recently went on a one day hay strike? No clue why because she had been eating really well. She gets locked in am/pm for her food and gets the skinny horse alfalfa. Her rain rot is starting to clear up and she just has a brighter look in her eye. I think she is ready for some trails so that will be the next step. If I lived in a perfect world before a horse even started their retraining they would have gotten a visit from the farrier, dentist and chiropractor. Pain in the feet can make a horse reluctant to work correctly. I don’t think every horse needs shoes but some do in order to be comfortable. I have had so many horses that had a mess going on in their mouths and once you fix that you get an instant change in their work. I believe chiropractors can work magic but sometimes I think you really have to be a feeling rider to understand the difference a few visits can make on a horse. All those visits cost money but they save you money and time in the long run. 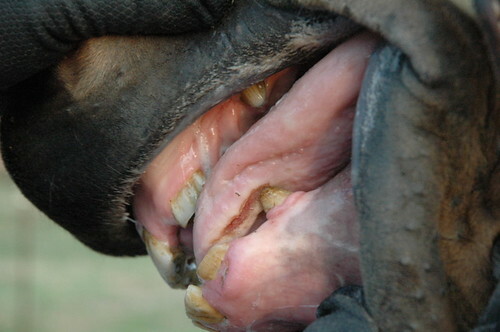 If you are trying to train a horse who is uncomfortable in it’s mouth, feet and body it is going to be a fight. They physically may not be able to do what you are asking no matter how hard you try. Some examples from my experiences. Chiro- When I got Dixie in for retraining he was fairly balanced but going to the right he was as stiff as a board and has no right lead at all. His body just felt locked to me and trying to get him to bend and move was a challenge. I told Allie I thought he needed the chiro to come and see if that would make a difference. 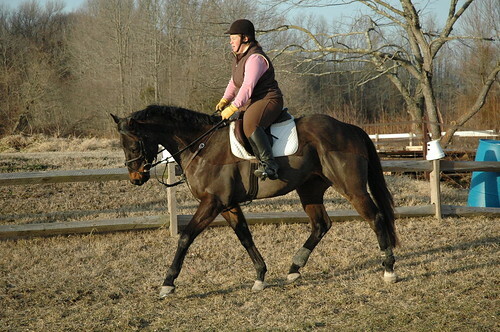 He proved to me that just one adjustment could result in a different horse. After that one chiropractic adjustment he never again had trouble with his right lead and he became much more rideable on the flat. I also think it just plain made him feel better which resulted in a personality change. We also found out that Bella (Escape by Sea) was very out of alignment when we ran into some issues with mounting. My chiropractor who is also a vet said the one reason she started to explore chiropractic was trying to figure out why horses who are so sweet and easy to work with on the ground had behavioral issues when being ridden. Bella arrived with a very slight issue with mounting where she would scoot off when you got on her which is no biggie to me. However, it progressed to her feeling like she wanted to explode the first 2-3 min of the ride and then she would be fine. Yep, she was really out of place both in her withers and her neck. It wasn’t a saddle fit issue but more of an issue of when you mount up you pull them to the side which hurts. She was much improved after a few adjustments! He has a super fat tongue and his canines were sharp and had cut underneath his tongue. I felt horrible..beyond horrible. I had never seen that happen before and learned a really good lesson from it. Feet- Don’t we all love TB feet 🙂 They can be a true challenge and having a farrier that understands how to deal with the various issues that plague TB’s is worth it’s weight in gold. I have an excellent farrier who rolls his eyes everytime I get a new horse in. He swears I take these horses on purpose because I know he can fix them. Some of the recent challenges we had were Dixie who had major cracks in his feet after he blew out heel abscesses and Bella who had thin soft feet. We addressed the severe cracks in dixie’s feet by using pads with equipak to change the load off the feet so the cracks would grow down. Bella had to wear a cycle of the glue on shoes this summer because she couldn’t hold a regular shoe. Although those sigafoos glue on shoes are expensive they really work great for allowing a horse to grow enough foot that you will have something to work with. When the ground gets really hard you might find you need to add pads to help these guys with thin soles when jumping. There is so much more that goes into correct farrier work but I am not a professional in that area. I have learned a lot but I feel like I still have a ton to learn. I do know that it truly takes not being afraid to set the shoe back and support the heels. This freaks people out because you often have a quite a bit of shoe sticking out under the heels. In my limited rides on both Dee and Parker I thought they were both in need of the chiropractor but especially Dee! She was so stiff to the right and locked everywhere. I often don’t say anything to my chiro and just let her develop her findings and see if they match what I was feeling. She instantly started to work on Dee and said how stiff she was all over. She did quite a bit of work on her so I have given her a few days to just adjust and I can’t wait to see if she feels different. I was expecting her to find more with Parker thinking something could have been bothering him in behind to cause him to be so grouchy about the canter. She thought everything behind the saddle looked great but that he was slightly out in his wither, ribs and neck which could have caused him enough discomfort to be grouchy. I was eager to get on him and see if it made a difference and I could be imagining it but he was much more comfortable all over last night and I had a super ride. My horse also felt very supple and I got good news from her when she told me that my guy felt as good as he has ever been. 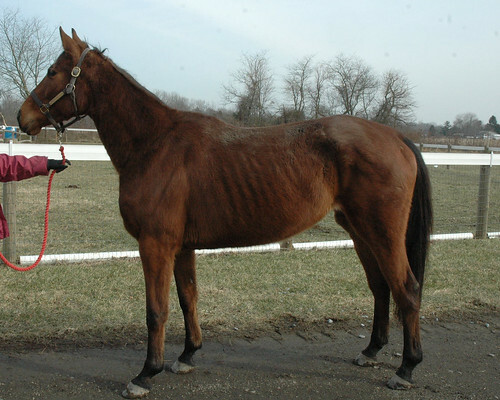 I am headed up to Delaware Park tomorrow for a track visit and to do a farm visit with a trainer who has a few horses. His horses are always nice so I am looking forward to seeing what he has. Wow, you couldn’t ask for two nicer horses to clip. Kurt clipped Parker and then I finished up his trimming. He stood so nicely and was just perfect. He loves the attention and treats 🙂 Dee was up next and I felt bad for her because her poor hair went every direction and she is thin so it was hard figuring out which way her hair was growing so you could cut. She was so nice and just loves the attention. She was leaning into the clippers a few times like she actually enjoyed it. She looks like a horse that I want to hide behind the barn for a month or two before anybody sees her especially with the clip job that looks more like a butcher 🙂 I think she is going to be adorable in about two months but attitude is everything and you couldn’t ask for a nicer horse. I am so excited about working with her. We are going to try to hit the local trail system tomorrow with a bunch of them. It is so muddy here with an inch of rain on top of a melting ground. Luckily the trail system is super sandy so I hope it doesn’t rain all day tomorrow. Everyone is snuggled in their stalls with lots of hay on this nasty night. The weather finally warmed up enough for the ground to not be as hard as a rock but instead we had wet slick sticky mud. Oh well that would be softer on her feet so it was as good as time as any. First we took a few conformation pics. It is always good to have before and after shots. She is thin right now with no muscle and I almost feel bad for riding her because I am not that light. She looks like she has already gained some weight here but it will be a bit of time before she starts filling out. I put her on the lunge line long enough to figure out that she has no clue about lunging but was quiet enough that I didn’t need to worry about that. I don’t spend a lot of time lunging horses anyway unless I think I might really need to get energy off them first. She stood perfectly for me to get on her but she had us laughing because she is a lip clapper. The whole time she claps her lips together chomping and making all sorts of noises. Funny girl 🙂 She was super quiet and straight forward to ride. Didn’t look around at all and seemed relaxed. The only thing that struck me as strange is that when going right she almost halfpasses instead of going straight. Her head points left and her haunches are so far right it was very weird feeling. I suspect she hasn’t spent much time going right and her muscles need some work. She will get the chiro very soon. I did work a bit on leg yeilding her to the left when going right and was able to get a few straight steps and quit with that. I am sure I had a bit to much contact but I was trying to push her straight and keep her from flying across the ring to the right. She got a bath which she really seemed to enjoy and hopefully I will clip her tomorrow. I also have had two great rides on Parker out on the trails. He is absolutely lovely and dead brave out there. Seems much happier in the herm sprenger duo bit and the trails made him happy. He looks so much better with his bath but we didn’t get a chance to get pics of him today. It has been a crazy week for me and I was hoping it would work out that I could get Parker on a trail ride today so thankfully it did. I changed his bit to the herm sprenger duo hoping that would make him relax a bit. Tara and I tacked up the horses with saddles and put them on the trailer. It is a quick 5 min ride around the corner. I am trying to work with Parker to get him to self load. He will walk right up if you lead him but he isn’t about to walk up by himself yet. We will work on that. He didn’t want to back out of the trailer by himself the last few times but today he backed out nicely twice. I have to pull his tail each step but he is figuring it out. When we got home he finally got a bath and oh boy did he love it! He leaned into the sponge and curled his lip up as I scrubbed him. Total bliss for the Parkster. I conditioned his tail but boy is his tail thick and curly. Sprayed some good old Canter Silk detangler in there so I will tackle it more tomorrow. He even loved getting his face washed and didn’t care if I sprayed his face with the hose. Maybe he just likes the warm water but he seemed like a happy horse. I really think he just needs his person so hopefully we can form a bond. He was 100% happier today when I rode him and just had a very relaxed feel to him. For the next month I think we will just be taking it easy to get him fit and happy again. Tomorrow he is getting clipped and I will get some pics and video as I will finally have some helpers around. I am also getting on Dee!!!! So excited. I finally saw her trotting and cantering around yesterday and she is a cute mover. Can’t wait to see what she is all about. She is also getting her bath and clip tomorrow. She stinks. Everyone is asking for updates on the horses but I haven’t been able to get much riding in at all. My whole routine has changed with all the construction going on at the farm. When we built our farm we designed all the paddocks to make it super simple and quick. The stalls all have dutch doors which lead out to our sacrifice paddocks. There are 4 stalls on each side of the barn and two stalls share the same paddock but you can open up the gate in between to combine all the horses. Then another gate to lead out to the fields. The fields connect and you can close off one gate and open another to rotate your fields. This means I almost never have to walk in a horse from a field and their is no fighting at feed time at the gates. So easy! The horses can come and go in their stalls as they like so stall cleaning is easy mainly just picking piles here and there. Right now the fences are taken down so my 5 min feeding routine takes 30 min to walk in all the horses and feed. I also have to water all the buckets in the barn when normally there are two water troughs and that is it. The water trough sits under the fence so 1/2 is on each side. The horses know they go outside to drink. Simple! My normal schedule is rush home and feed quick but be on a horse by 4:15. Ride 20 min and then ride one more before I run out of daylight. Yes, I can tack/untack quite quickly. Now I get home and by the time I get done talking to the contractors, checking their work, brining horses in, feeding and watering I am out of time to ride. Yes, I could go to an indoor but I would also like to spend a tiny bit of time with my hubby who works the night shift. Normally he comes out to the barn to help with chores but he has been staying up later after he comes home from work in the morning to talk to the contractors and do minor projects to keep the work on progress. Our paddocks should be finished today so life will get back to normal. They are looking really good! We got the gutters on yesterday which should keep all the water from flowing around the barn. The paddocks were scraped out and filled back in with fill, geotextile and we used millings for a footing. He graded everything to fall away from the barn. We shouldn’t have anymore issues with mud which will be great because the horses are going to need to be kept in the small paddocks after I replant all the grass. The riding ring will get started either tomorrow or next week and I will have lights. Lights are going to make all the difference in the world for me to earn a bit more income riding and also ensure I have the horses on a consistent schedule. I have been spending a lot of time grooming both Dee and Parker who have some rain rot on their backs. They both love the attention and with the warmer weather they are going to get a bath and clip job. It has been to cold to do either so it will be a busy weekend of catching up on all things that have been put off due to cold weather. I had a bit of an incident with Parker over the weekend that resulted in me falling off. I was sore and bruised from him grazing my leg on my way down. It was not a big deal more of us getting to know each other and him not wanting to canter and letting me know. The thing about winter is wearing all the clothes and being out of shape makes you not stick in the saddle as well 🙂 He sort of did a prop, stop and buck which I totally didn’t see coming and I did a slow mo straddle the saddle and fall off the right side. He stood there looking at me like I was the stupid one. Really no biggie but he has some baggage and I need to develop a plan to make him happy in his work again. So far that plan includes changing to a soft bit, chiro work and good old trail riding to make him forget about the ring for a bit. I am so excited for this warmer weather and the possibility that I may actually be able to go fox hunting sometime this month!